Ip. is the head remedy for nausea and vomiting. Constant nausea. Nausea not relieved by vomiting. Nausea with accumulation of saliva in the mouth. Nausea with distention of abdomen and dryness in throat. Nausea with heaviness in the abdomen. Nausea and vomiting renewed by eating. Vomiting of infants at the breast. Vomiting during and after chill. Vomiting after drinking, even smallest quantity. Clean tongue. Clean tongue is a keynote symptom of Ipecac. Vomiting of sour milk in children. Everything in the stomach seems to turns in to vinegar. Nausea and vomiting with every bad taste in mouth. Vomiting about one or two hours after eating. Vomiting of bile, food, sour matter. Persistent nausea with nearly all symptoms. Nausea in warm room, ameliorate in open air. Nausea and vomiting during chill. Vomiting before and during menses. Nausea and vomiting in the morning. Nausea, vomiting and much retching. Sour taste and nausea in the morning. 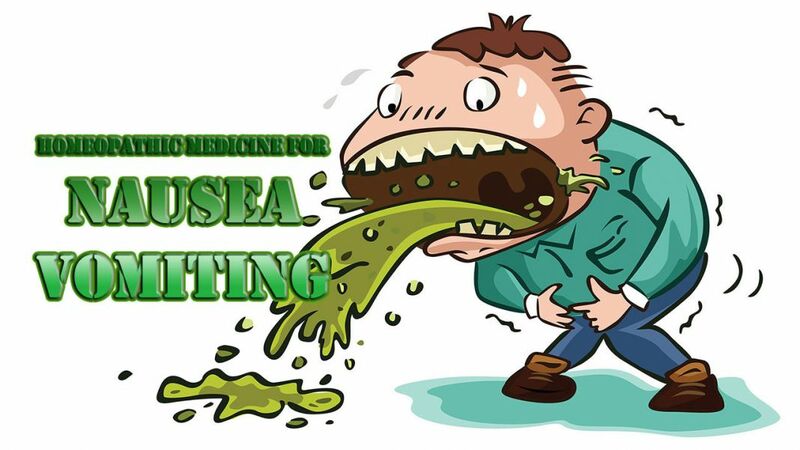 Nausea, retching, vomiting after eating or drinking. Cannot bear the sight, smell or thought of food. Nausea from smell and thought of food. Craves ice–cold water, which distresses the stomach and is vomited immediately. Intense burning pain in stomach. Smell of food causes nausea, even to fainting, especially fish. Vomiting of mucus, bile and food, worse any motion. Vomiting first food, then bile. Loathes the smell or sight of food. Nausea and anxiety from the smell of cooking or from fatty food. Even smell of food in another room or kitchen nauseates the patient. Nausea from the odor of fat, meat or eggs. Nausea or vomiting by riding in carriage or sailing in a boat. Nausea and accumulation of water in mouth. Nausea, morning nausea (N. V.). Nausea after eating or often relieved by eating. Vomiting of food and bile in the morning. Vomiting of food or of milky fluid, bile during pregnancy. Nausea at smell or sight of food or thought of food. Nausea and irritability on thought of coition. Nausea in the morning when rinsing mouth. Great indifference to everything, to occupation, to members of family. After eating, pressure in the stomach, as if a stone. Nausea better lying on right side. Vomiting first bile, then food, of bitter substances, of yellow-green mucus. Nausea, vertigo a cold sweat. Incessant nausea, worse from tobacco smoke. Nausea and vomiting, relieved by uncovering abdomen. Nausea, sour eructation, profuse vomiting of an intensely sour fluid, so sour that it sets the teeth on edge or dulls them. Vomiting of bile, of green liquid. Nausea from smell or sight of food. Vomits water or food that has been taken or bile as the chill passes off. Water is thrown up as soon as it gets warm in the stomach. Vomiting temporarily better by ice-cold drinks. A very goody remedy in vomiting of children, where large, green curds of milk are vomited, followed by great exhaustion. Cannot bear milk in any form. Milk is forcibly ejected almost as soon as swallowed, then weakness causes drowsiness. Hungry after vomiting, eats and vomits again. Nausea at smell or sight of food. Vomiting with a white coated tongue is the characteristic of this remedy. Patient vomits as soon as he eats or drinks. After nursing the child vomits its milk in curds and refuses to nurse afterwards and is very cross. Vomiting of food several hours after eating. Nausea and vomiting before menses. Vomiting of pregnancy, sweetish water. Water is vomited as soon as it reaches to stomach. The patient vomits milk as soon as taken, in sour cakes and curds. Frequent sour eructation, sour vomiting of curdled milk. Sour vomiting especially during dentition. Vomits mucus instead of food.